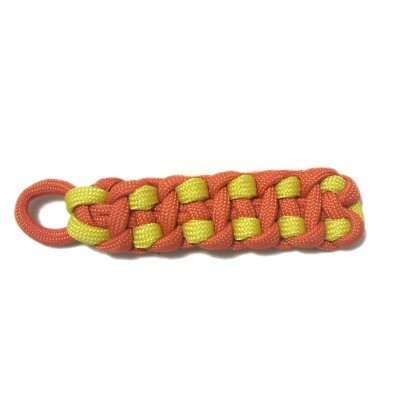 Description: The Footprint Bar is a Square Knot pattern tied around an extra cord. The extra cord forms a series of loops resembling footprints. A loop is usually left at one end of the sennit, to be used as part of a clasp, or to attach a key ring. At the other end, a button knot can be tied. 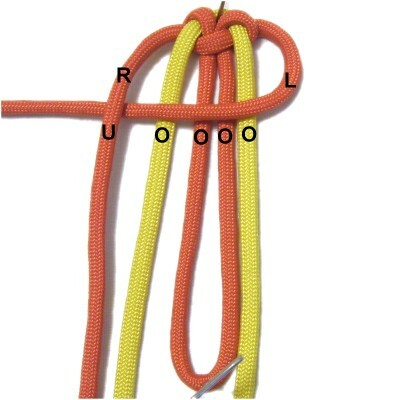 The images show nylon Parachute cord, which I recommend you use when practicing knots. See Cord Preparation for more details on how to prepare the material properly. This decorative knot was found on the Fusion Knots website as the "Caterpillar Footed Solomon Bar"
Click on the image or link to visit. 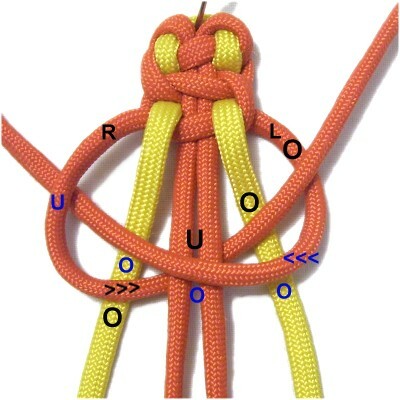 The video gallery contains many interesting knot patterns and techniques. Preparation: To practice the Footprint bar, cut one working cord, at least 60 inches long. Cord 2 should be at least 36 inches long. In the images, the working cord is orange and cord 2 is yellow. To make a Macrame project with the Footprint Bar, the working cord needs to be cut to at least 15 x the finished length of what you want to make. So for a 4-inch sennit, you need at least 60 inches. Cord 2 should be 3 x the finished length, and should be a contrasting color. 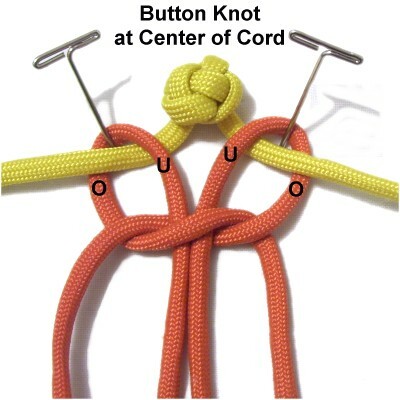 Cut this cord longer if you plan to tie a button knot to form a clasp. Step 1: Fold the working cord in half and secure it at the center, arranged vertically. The folded area should be close to the front of your board with the remainder heading away from you. Mentally label the two halves, which are called "working cords" (WC) in these instructions. Bring both working cords towards the front of the board, folding them again. Secure the folds. The distance between the two folded areas should be equal to the total finished length you are aiming for, which includes a loop at one end. Since you are just practicing, make it 4 inches. 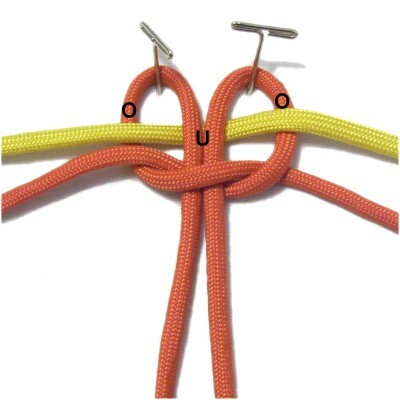 Step 2: Now you will tie the first half of a Square knot. The folded portion is considered the fillers. 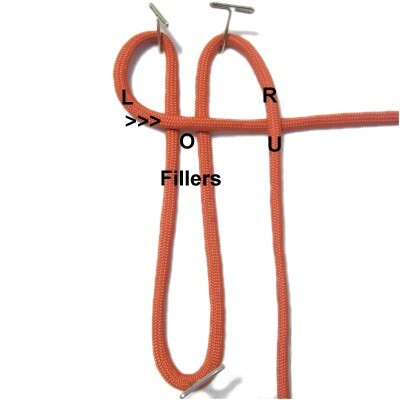 Move the left working cord to the right, passing it over the fillers and under the right working cord. Move the right working cord to the left, passing it under the fillers. As you pull it out on the left, pass it over the left cord. Tighten the knot slightly, but leave it a little loose. Step 3: Pass cord 2 through the folded area, which look like two loops. Pass it over - under - over, arranged horizontally. Match the ends to center the new cord, then pull both working cords to tighten. Should you decide to use the Footprint Bar to make a Paracord Bracelet, tie a button knot at the center of cord 2. Then slide it through both loops under - over. Secure the knot, then tighten the loops. Designer's Tip: The button knot shown in the image above is the Knife Knot, also called the Diamond knot. It's the easiest button knot to tighten, so I recommend you try it as a clasp for the Footprint Bar. 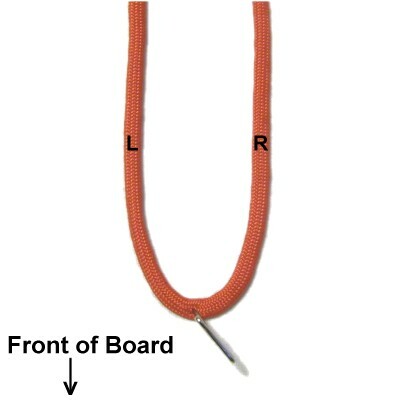 You could also attach a regular button or a bead at the center of cord 2, which can also be used to make a clasp. 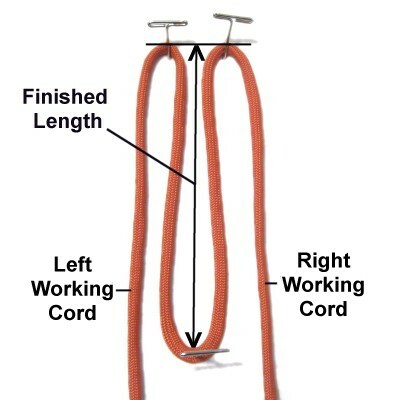 Step 3, continued: Arrange the cords vertically as shown, placing the two halves of cord 2 between the working cords and the fillers (folded portion). 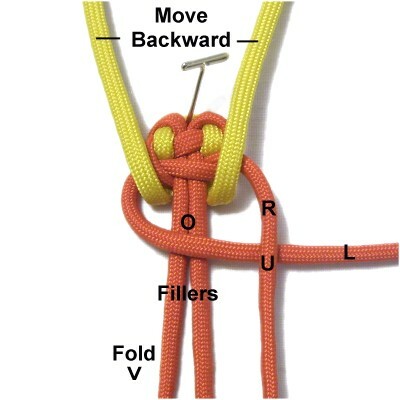 Step 4: To start the second half of the Square knot, move the left working cord to the left horizontally, passing over the fillers and cord 2. Bring it under the right working cord. 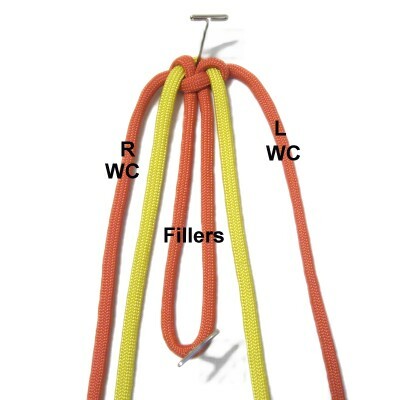 Move the right working cord to the right, passing over the left half of cord 2, and under the fillers. As you pull it out on the right, make sure it goes over the right half of cord 2 and over the left working cord. 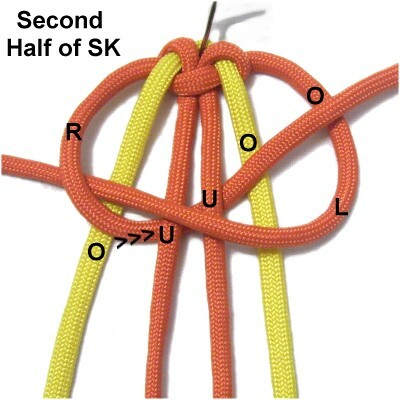 Tighten the second half of the SK completely. Designer's Tip: The most important thing to remember about this important step is that the working cord only passes under one portion, the fillers. It passes over all the other segments. It helps if you arrange the cord on a diagonal slant as shown in the image above. Step 5: Move both halves of cord 2 backward, towards the back of your board. 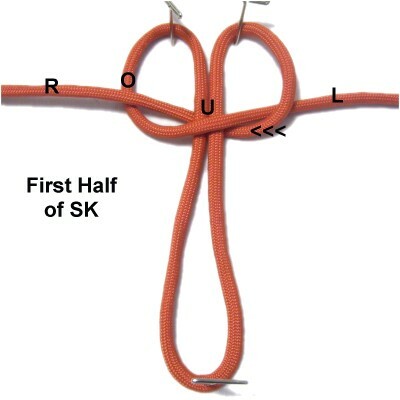 Start the first half of the next SK by moving the left working cord to the right, over the fillers and under the right working cord. Move the right working cord under the fillers. Bring it over the left working cord, as you pull it out on the left. Pull the working cords firmly to tighten the first half of the SK. 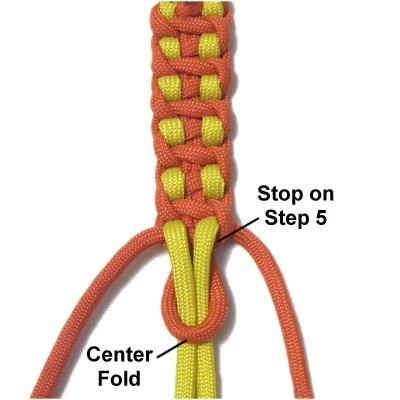 Step 6: Repeat step 4 to tie the second half of the Square knot. In this image, the path of the left working cord is shown in small blue letters. The path of the right working cord is shown in larger black letters. Step 7: Repeat steps 5 and 6 several more times, until the last SK is 3/4-inches from the center fold. This gives you a small loop for a clasp or key ring. Pass the ends of cord 2 through the center fold. 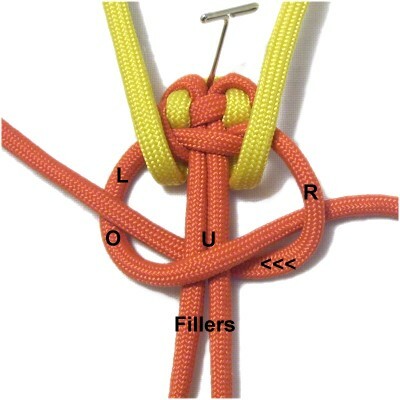 Designer's Tip: Before moving on, check to see if the button knot fits through the loop. Sometimes all you need to do is push the SK closer together to give the loop more space for the button knot, if it's a little too small. Step 8: Turn the Footprint Bar upside down. 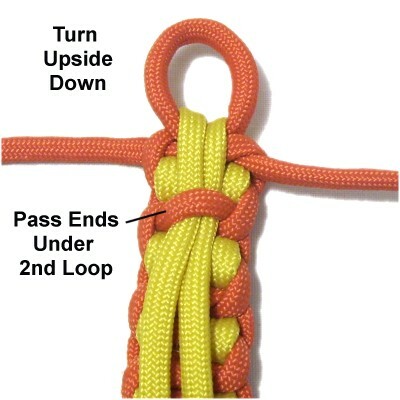 Pass the ends of both cords under the second loop, counting backward from the last knot tied. Apply glue, and then cut off the excess material. Use a flame to melt the tips if using Paracord. Have any comments about the Footprint Bar? Contact Me.